Potassium Fluoborate and Lead fluoborate are used as components of fluxing and plating chemicals in the electroplating industries. One of the major users of Potassium Fluoborate are manufacturers of resin bonded abrasives. It is used in manufacturing Titanium Boron Aluminium alloy grain refiners in aluminium and manganese foundry. Potassium Fluoborate salts are one of the most important additives in arc welding rods and in metal treatment foundry flux chemicals; Other uses of fluoborate salts are in preparation of glazing frits. We also manufacture Lithium Fluoborate and Sodium Fluoborate as per customer requirements. Lithium Fluoborate is one of the chemicals used for manufacturing organic Lithium Ion Batteries. It is also used as grain refiner for Aluminium, Manganese and Magnesium metals. Sodium Fluoborate is used for manufacturing of organic chemicals and salts. It is also used as catalyst in organic synthesis. Sodium fluoborate is used as an additive in chrome, nickel & cadmium plating baths and used as flame retardant for cotton & rayon. We are one of the leading Sodium Fluoborate manufacturer. 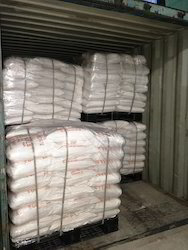 Potassium fluoborate is also known as Potassium terafluoroborate and available in white crystalline powder. It is used for various applications such as a component in fluxing and grain refining agents for Aluminium and Magnesium. 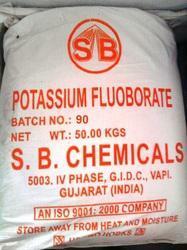 We SB Chemicals is one of the trusted Potassium Fluoborate manufacturer and supplier. It can also be used as active filler in resin bonded abrasives for metal treatment and a component in fluxing agents for soldering and brazing. Purity as KBF4 98.00 Min. Sulphate as SO4 0.10 Max. Packaging Details: 25 / 50 / 1000 Kg in plastic woven bags with liner. Looking for Tetrafluoborate or Fluoroborate salts ?